Here’s an eye-witness account of the iron curtain press conference Alfred Sant, Miriam Dalli and Marlene Mizzi delivered Tuesday. Frank is right. The most significant thing about the whole charade was the fact that it was scheduled to start right as the ceremony naming the same room for Daphne Caruana Galizia ended. It was an act of intentional bad taste. This was no innocent faux pas. It was a formal insult ceremoniously delivered to a grieving family. It was the parliamentary equivalent of wrapping fish in a punctured bullet-proof jacket and delivering it to the mourning spouse. Just in case anyone did not miss the Labour MEPs at the naming ceremony, they wanted to make sure everybody realises they had not been there. There was a huge delegation of tagħnalkollers from Dar Malta in Strasbourg that day. As far as I can tell all (but one, Permanent Representative Marlene Bonnici) stayed away for the naming ceremony and then fell upon the room when it was over in order to give that angry, growling look that is supposed to intimidate you into silence. But when Cyrus Engerer gives me that look, I’m sorry, I can’t help but laughing a little. I try to keep a straight face, I promise. I really can never win a staring contest with someone quite so ridiculous. And then Alfred Sant took the stage. For me and, I imagine, for him, this was a nostalgia trip. There he was, flanked by two people, as he always used to be, calmly stating the most outrageous things as if they were self evident logic and then turning to his acolytes to confirm what he just said. I half expected him to address Dalli and Mizzi as “George” and “George”. The older among you will get that one. It was a real time warp watching him speak. And not in a good way. It wasn’t just the perverse nostalgia of remembering him in office saying things like VAT should go or the EU will flood us with hairdressers. It was a time-warp to the controlled press conferences of a Socialist regime that speaks of “the will of the people” in the Leninist sense that the ruling regime is entitled to lie if that helps the perpetuation of its power. These people say democrats insisting on rule of law and fundamental freedoms in Malta are harming the country abroad. Does Alfred Sant not realise how his pulitburo attitude goes down with the international press when a colleague of theirs had less than a month before been blown up and the most obvious beneficiaries of her death are politicians in office? Not well at all. 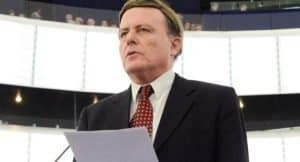 Does Alfred Sant not realise how the civilised world perceives his rubbing shoulders with his fascist friends, holocaust deniers, and far right nationalists in the European Parliament? For they formed the bulk of the few that voted with him against a motion that asked Malta to show itself to be European as it once did before a criminal gang took over here. Indeed, please, stop harming our country. Here’s Frank’s commentary on that unreal hour. GUEST POST: Who is the traitor then?